The Media Industry has it own unique set of communications when trying to present its own set of unique offerings. There is a bit of irony here. The media industry of course by definition provides the most compelling content typically in the form of narratives or news across television, newspapers and magazines, internet, movies and gaming channels. 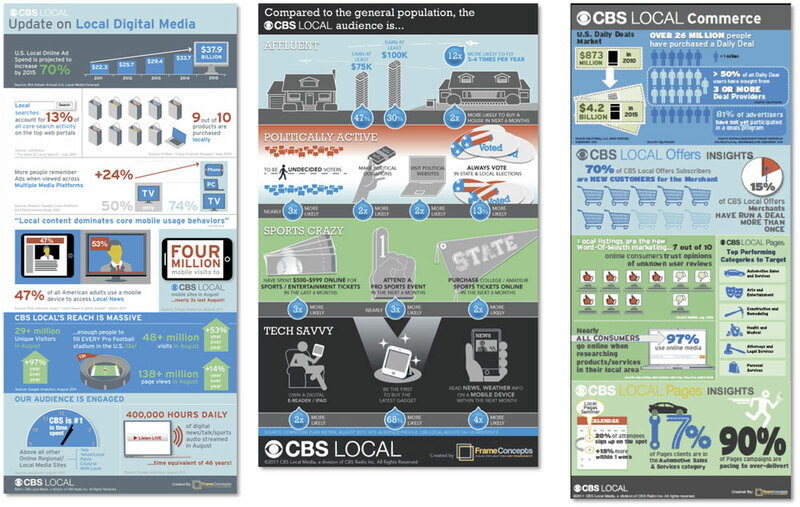 And then to add to the irony, media infographics themselves arrived on the scene largely through the newspaper channel where data journalist told complex stories in the forms of charts and iconography. But positioning your offering is a different thing and this is where the Frame Visual Solutions can help. Traffic Numbers to Revenue Translation – How your media offering’s compelling traffic numbers translates to revenue needs to be understood. 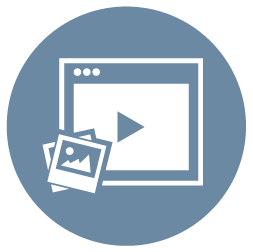 The Media Buyer Expects “Sizzle” – Spreadsheet and PowerPoint bullet points with stock photos will underwhelm your media buyer. 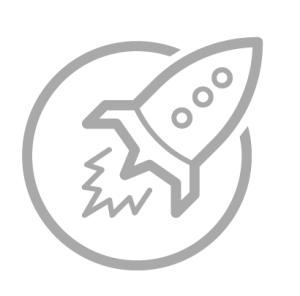 Innovation in Media – Just like your startup colleagues in the Silicon Valley, you need your innovation to be visualized to get buy-in. 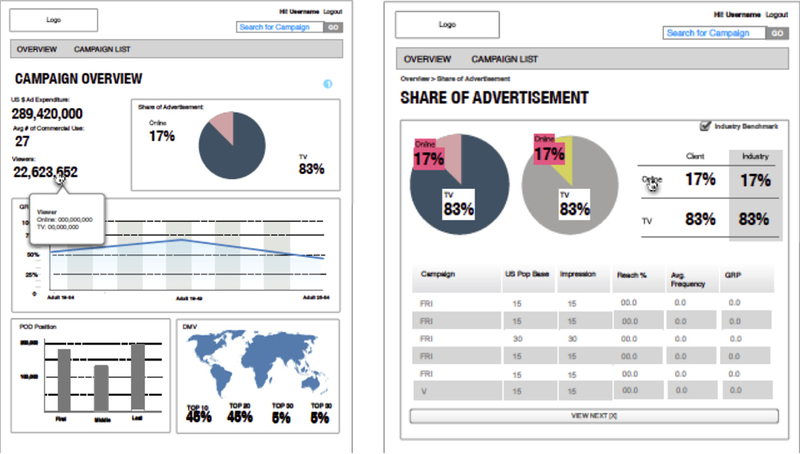 The Complexity of Media Platform Delivery – The media buyer has to come to terms with the technical features of your platform as well as the complex data metrics – why not make it easier on them visually? CBS Digital is a younger division then CBS TV and Radio and actually competes against them for ad spend during the annual adweek buying frenzy. Do stand out during the three-day event, CBS had Frame Concepts create three compelling infograpics showcasing their attractive demographics releasing them one each day from Monday to Wednesday. 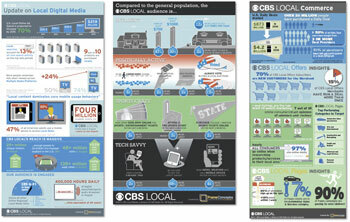 In a field of metric-filled spreadsheets, CBS Digital stood out. The independent film industry has always been challenged to get movies funded, secure movie theatre distribution and earn a profit. 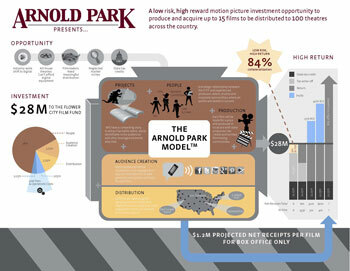 ArnoldPark startup made a new model connecting new investors with independent filmmakers through a new platform that offered the latest film projector technology to smaller movie houses and clarified the return on investment numbers in the murky world of the film industry. The one page pictogram was key to showcasing the model to early adopters. 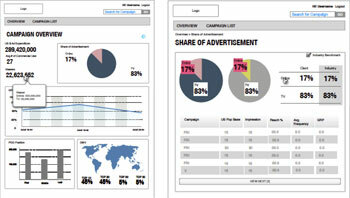 Breaking new ground by offering campaign performance both on TV and online metrics from one source, DG IT turned to Frame Concepts to develop data visualization and user interface to highlight to its beta customers the inherent value of the new integrated platform.